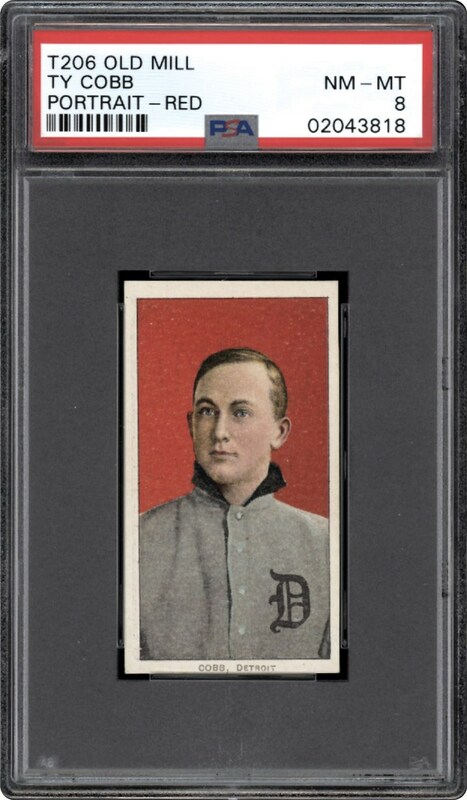 It is only fitting that this miraculous PSA NM/MT 8 Ty Cobb Red Portrait Old Mill offering stand as the irrefutable "king of the hill"; with its "1 of 1" and highest graded stature placing it as the finest of its kind! Indeed, synonymous with this breathtaking tobacco gem is Ty Cobb's arguable status as our National Pastime's foremost "turn of the century" player. Still holder of the highest Major League lifetime batting average at an unfathomable .366 clip, Ty Cobb was a 1936 charter member of baseball's illustrious Hall of Fame, and his fiery play easily places him as the most intense competitors the diamond has ever seen. His relentless will to be the best at anything he did ably assisted him in earning an incomprehensible 12 batting titles in 13 seasons, eclipsing the .400 mark three times in that span and setting a batting standard that may never be witnessed again! Therefore, it come as little surprise that many of the hobby's most advanced collectors seek his most prized artifacts, with only a handful possibly competing with this "best of the rest" gem. No baseball card collection can be considered complete without a serious pre-WWI card of the immortal Ty Cobb, and no Cobb cardboard memento could possibly be more renowned than his legendary T206 Red Portrait subject reflecting the majestic Carl Horner portrait Cobb image. Of the highly coveted four T206 Ty Cobbs, both the "Red" and "Green" portrait poses stand as hobby icons. With that in mind, what elite enthusiast wouldn't want to own an example that stands tall as the premier Old Mill marvel in our illustrious hobby. Listed as one of the "Top 250 Sportscards" in PSA's classic hobby publication, the pricing points for this immortal card continue to soar like an uncontrollable tsunami for all grades. Each passing sale presents a higher price tag including a PSA 8 Sweet Caporal specimen selling for a staggering $192,000 in the Summer of 2018! More significantly, it certainly appears that the Red Portrait Cobb is slowly "closing the gap" with its Green Portrait brethren that fetched a record setting $360,000 price tag in that same Summer 2018 auction. Unquestionably, any high-grade T206 "Red Portrait" Cobb continues to be one of the best "buys" in the hobby with incredible investment potential. Standing by the concept of "todays retail is tomorrow's wholesale", we cannot even begin to fathom the historic level this finest "1 of 1" Old Mill Cobb offering might be sitting at some 3-5 years down the road. There is undeniably a substantial level of pricing growth for any PSA NM/MT 8 Red Portrait Cobb versus its Green Portrait peer, with its already stratospheric value surely capable of "taking off' once again in the near future. Economics 101 clearly encourages the notion of "buy low – sell high", and this aesthetically brilliant and highest graded PSA 8 Red Cobb w/an obscure Old Mill ad back currently resides as the quintessential examples for this pricing surge phenomenon! Regarding the condition of this museum worthy masterpiece, it appears as if the card was just pulled from a century+ old pack of Old Mill Cigarettes! Near-immaculate to say the least, Cobb's classic Carl Horner portrait pose exhibits a brilliant array of facial hues, with the image literally "coming to life" via the seemingly flawless fire-engine red background that sits between four absolutely blinding white borders. The exceptional centering only depicts an extremely slight favoritism towards the lower right edges, and the corners could easily draw blood via their razor sharp 90-degree tips. 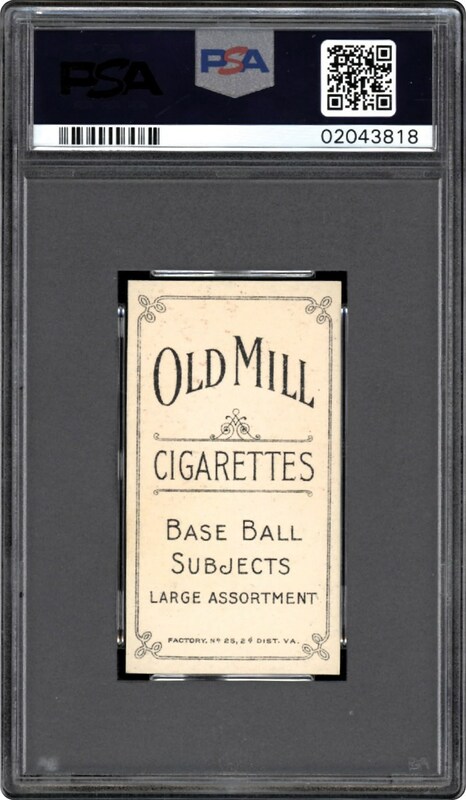 Brilliant surfaces reveal no major flaws whatsoever to the naked eye, and the reverse side's critical "OLD MILL" cigarettes advertisement is as bold/vivid as its original factory issued date. A steadfast symbol of early 20th century baseball, this timeless marvel effectively "turns back the clock" to an era when the game evolved as America's pastime, making even the most sophisticated enthusiast feel young again. More significantly, however, its most recent pricing trends clearly indicate its upward climb projects no end is in sight. Since 2016 (and at the time this was written), the last six PSA 8's have chronologically sold for $35K; $41K; $49K; $54K; $67K and the aforementioned most recent $192K record sale. Therefore, in a three-year period, the iconic PSA 8 "Red Cobb" has increased its value $157K or a whopping 449%! With seemingly no end for this infinite-like pricing surge, we continue to look at that $360K sale for a PSA 8 Green Cobb and cannot help but think that gap will continue to be shortened with each and every passing Red Cobb sale. Regarding this SOLE and FINEST GRADED PSA 8 Old Mill offering, we can only defer to you, the sophisticated collector, to ultimately determine its true worth!